Hyperbaric Oxygen Therapy is a non invasive therapy. The patient breathes 100% oxygen while in a chamber pressurized to greater than normal atmospheric pressure. HBO is a well founded and accepted technology, it assists in the treatment of certain difficult, persistant, costly or otherwise seemingly hopeless medical problems. Studies in HBO began in the 1930’s with the purpose of treating decompression sickness and reducing the decompression times in diving operations. In the 1950’s and 60’s other studies focused on the use of Oxygen medicine and space exploration, unfortunately, the knowledge gained was generally confined to those physicians and scientists involved in space or sub-sea activities. This restriction contributed to the confusion regarding the use of HBO for clinical management of patients. This confusion, which was evident at the time, is still prevails today. Throughout the past 70 years, a large volume of confirmed data was built up through controlled animal and human studies. In addition, clinical data was gathered from various activities in medical establishments throughout the world. However, progress was hampered by the lack of equipment and personnel equal to the standards of patient care demanded by modern medicine. Despite these difficulties, research and the use of HBO in clinical problems has continued quietly and professionally in various parts of the world. In this environment the firm physiological basis for supporting its use in a growing number of medical conditions has been established. Clinical HBO therapy had its foundation in the 1950’s with the work carried out by Boerema, Brummelkamp and others at the university of Amsterdam, and was complimented by the pioneering work of Illingworth and others in Glasgow. In Japan during 1965, after a coal mining explosion it was proven that HBO resolves lung damage from smoke inhalation and also resolves burn injuries promptly. The development of HBO therapy was largely pioneered in the United States, USSR, China and Japan, with lower levels of activity in many other parts of the world. 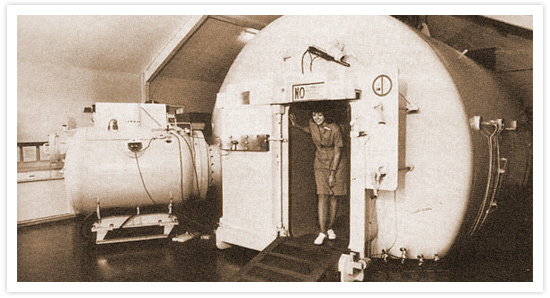 In the USA, the steady expansion of HBO therapy was the result of the activities of members of the Undersea and Hyperbaric Medical Society (UHMS). Formed in 1967 by physicians and scientists involved in supporting mans undersea work, the UHMS recognized the need to bring order and guidance to this important branch of medicine. Consequently in October 1975, they brought together 50 leading hyperbaric specialists from various parts of the world. This meeting culminated in the publication in 1978, of a state of the art list of accepted conditions and identification of promising research areas. Now regularly updated, the list provides a guide to physicians on current indications. Parallel research in Japan, which is now very active in HBO therapy, led to the publication of a similar list of accepted conditions by the Japanese Society of Hyperbaric Medicine. In China a primary treatment for stroke and heart attack is HBO. Currently, less is known of the activities in Russia but it is known that Russia has highly developed programs covering both research and clinical use of HBO. Today because of the proven benefit in the clinical management of an increasing number of acute and persistent medical problems, the use of HBO is growing continuously. HBO is now finding its proper place, as an important part of the armory available to modern medicine in the constant battle against the effects of injury and disease.